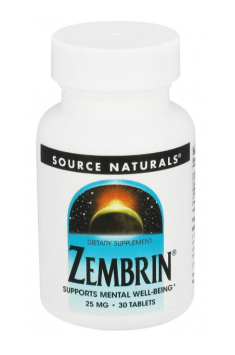 Source Naturals Zembrin® is a diet supplement containing a patented kanna extract - Zembrin®, the activity of which, has been scientifically proven. The product naturally helps to reduce the stress feeling, improve well-being and exhibits adaptogenic activity. One tablet contains 25 mg of extract. The product is suitable for vegans and vegetarians. Kanna (Sceletium tortuosum) is a plant growing in South Africa of long-established tradition and significant anti-stress as well as adaptogenic activity. The alkaloid compounds present in the plant, including mesembryne, are responsible for these effects on the nervous system. The advantage of these compounds is also their high bioavailability. Kanna alkaloids influence the inhibition of neurotransmitters reuptake. This is especially the case for serotonin, noradrenaline and dopamine. Changes in neurotransmission are the basis of many psychiatric disorders, whereas the inhibition of neurotransmitters reuptake is the mechanism of action of some antidepressants. A research was performed on a group of patients, which assesses the effect of kanna extract on changes in the brain occurring during anxiety disorders. Anxiety disorders are accompanied by increased activity of the hypothalamus and amygdala. The experiment showed that the extract inhibited the activity of these two brain structures. The authors of the study indicate the efficacy of kanna compounds in the treatment of some psychiatric disorders, including depression and anxiety disorders. Kanna shows proven anti-stress properties. It can increase the organism’s immunity to stress factors and help to control sudden stress. Tests performed on previously stressed animals showed that in the group of animals taking the extract the symptoms of stress were significantly alleviated - there was a decrease in corticosterone concentration as well as lowered anxiety. Sceletium tortuosum can be helpful in the symptoms of depression. There was a case of a patient suffering from depression, accompanied by insomnia, anxiety, loss of appetite and a loss of energy levels. During the 4-month course of kanna extract, the patient observed a noticeable improvement in well-being and mental condition. After finishing the supplementation with the formulation, there were no unpleasant withdrawal symptoms, which often occur with some antidepressants. In addition, many researchers believe that kanna can be helpful in the fight against bulimia and drug addiction. Kanna can be helpful for people suffering from dementia diseases of old age. The studies showed that this extract had a positive effect on the well-being of people with Alzheimer's disease. Kanna supports cognitive functions. As a phosphodiesterase-4 (PDE-4) inhibitor, it increases the level of cellular cAMP, which results in an increase in cognitive functions, concentration and memory. That is why, kanna can be a good choice during the period of motivation decline and learning difficulties. In addition, PDE-4 inhibition complements and balances the inhibition of serotonin reuptake that can result in PDE-4 overexpression. To sum up, Source Naturals Zembrin® is a natural diet supplement with beneficial effects on the nervous system. It is recommended in states of physical and mental stress, worsened mood and anxiety as well as difficulties with concentration and memorization. Maltodextrin, dibasic calcium phosphate, silica, magnesium stearate, and stearic acid.